Eomap is patenting technology that can map the water depth and chlorophyll content of lakes in satellite photographs, providing quality control for environmental projects that clean algae from lakes. Such software processing is challenging to describe in patents, but the company made the investment to protect their innovations from competitors. A recent article provides an overview of satellite-derived bathymetry methods and how data can be integrated into survey campaigns, and showcases three use cases. Bathymetric data in shallow-water zones is of increasing importance to support various applications such as safety of navigation, reconnaissance surveys, coastal zone management or hydrodynamic modelling. A gap was identified between data demand, costs and the ability to map with ship and airborne sensors. This has led to the rise of a new tool to map shallow-water bathymetry using multispectral satellite image data, widely known as satellite-derived bathymetry (SDB). Figure 1: The diagram shows the relative amount of measured light energy that contains water depth information. Strictly speaking, the methods to derive information on seafloor topography using reflected sunlight date back to the 1970s but it has required iterative improvements of algorithms, computational power, satellite sensors and processing workflows to provide the current state of the art tool. Today, a range of different methods exist under the umbrella of the SDB term. However, as with traditional survey methods, it is imperative to understand the advantages, disadvantages and overall feasibility in order to evaluate the suitability and fit-for-purpose of a given SDB application. Historically, empirical methods were used, which require known depth information over the study area. By comparing these known depths with the satellite signal, a statistical relationship can be derived that adequately describes depth as a function of the signal. Aside from requiring known depth data, these methods will only work for a given satellite image. A subsequent satellite scene, even of the same location, may contain different atmospheric and in-water parameters, and thus the statistical relationship needs to be re-calculated. Another aspect of these methods is that the statistical relationship is only valid for one water type and one seafloor type. Therefore, if an area contains different types such as coral, sediment, algae and rubble, the statistical relationship needs to be calculated for each of these substrate types. The correct formula then needs to be applied to each pixel in the image, i.e. the algorithm needs to be informed a-priori which substrate type it is encountering in that image pixel. This brings the problem full circle back to one of the fundamental challenges of satellite-derived bathymetry: how do you know whether a darker signal is due to deeper water, a darker substratum, or a bit of both? These methods can still be useful as they are relatively straightforward to implement (see The IHO-IOC GEBCO Cook Book, 2016). Physics-based methods on the other hand, do not require known depth information for the study area, and can therefore be applied independent of satellite data type and study area. These methods rely on fully describing the physical relationship between the measured light signal and the water column depth. Optical variability in the atmosphere and water column is accounted for within the algorithm inversion, and no 'tuning' to known depths is required. Therefore, an area which is physically inaccessible and for which there is no previous information known can be targeted. Not surprisingly, these physics-based methods require more sophisticated algorithms and powerful processing capacity. The benefit is that they typically prove to be more accurate, especially in areas with varying substrate types, turbidity and/or atmospheric conditions. This is of particular importance because only a small fraction of the sunlight recorded by the satellite’s sensor originates from the source that can be associated with water depth. Depending on the wavelength channel, this fraction varies typically between less than one and up to a maximum of 20%, going from near-infrared to green/blue light energy. It is critical to accurately account for the other sources of light energy in order to separate out the relevant water column depth contribution to the measured signal. The integration of SDB data into daily use can be straightforward if the bathymetric data quality and delivery formats follow best practice. Hence the file formats typically follow industry standards (OGC) and enable a direct use in current GIS or online visualisation tools through Web Mapping of Coverage (WMS, WCS) interfaces, hydrographic software or scripting tools. 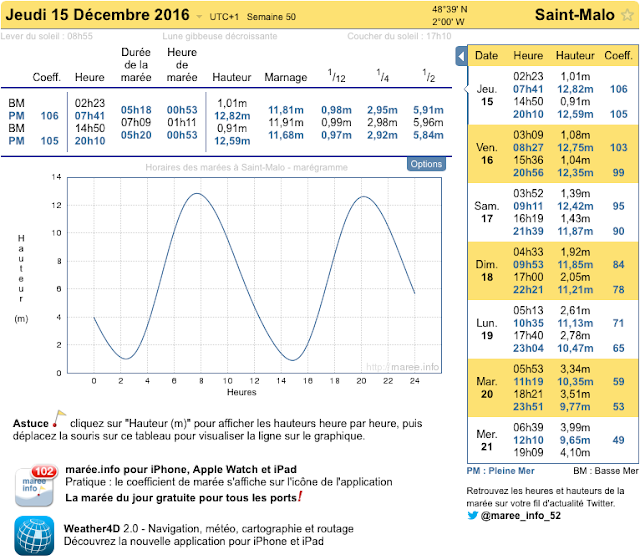 ISO conform metadata including important information on tidal corrections, processing levels and date and time of satellite recording are essential for geodata and are mandatory for all SDB data. Furthermore, it is important to understand the uncertainties in the data as well as the limitations of SDB for a given application in order to integrate the data appropriately. Such information needs to be expressed in uncertainty layers which should ideally include quantitative information. For some applications, such as safety of navigation, additional information such as the ability to identify obstructions of different sizes needs to be included as well. Satellite-derived Bathymetric information supports safety of navigation by providing up-to-date and high-resolution grids of the shallow-water zone. This is of particular importance in areas with outdated charts or dynamic seafloor. 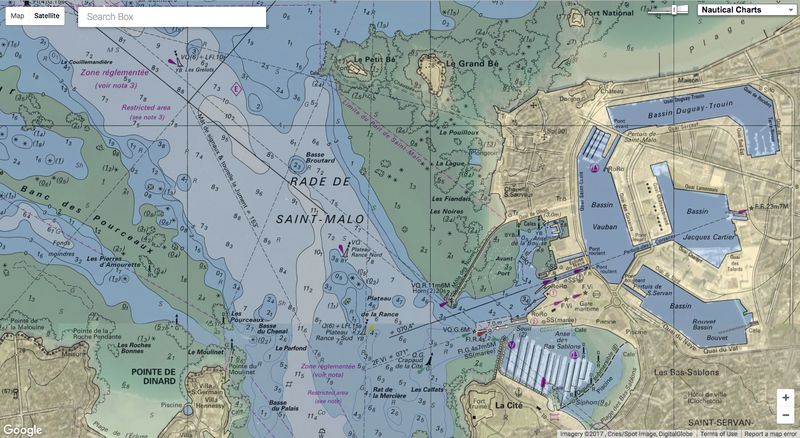 In addition to the bathymetric information, of particular importance is the identification of obstructions which could be a risk to navigation. Figure 2: Current ENC (March 2016, left) and overlaid by SDB data (right) showing shoals misplacement and low details of the ENC compared to the Satellite-derived Bathymetry-ENC. 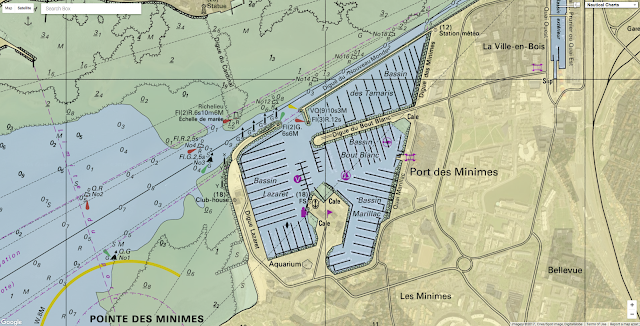 Ideally the bathymetric data are provided in the form of digital nautical charts (ENCs) and ECDIS (Electronic Chart and Display System) as the main navigation device which represents the standard for the majority of vessels. 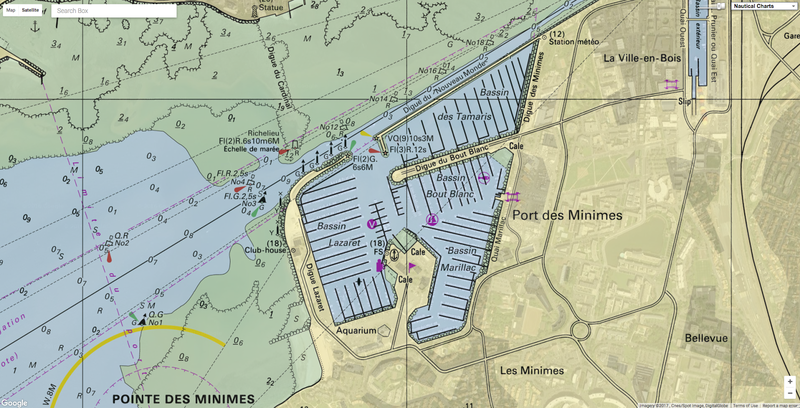 Satellite-derived Bathymetry data cannot immediately be used for navigation with ECDIS – however, it can serve as an additional data source when updating the bathymetric information of nautical charts (paper or digital). 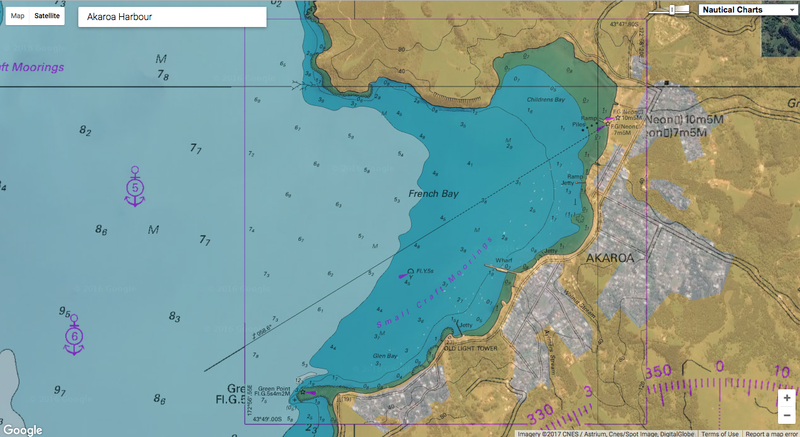 ENC Bathymetry Plotter, a recently finished software product of SevenCs’ chart production suite, represents a powerful tool to create depth-related information objects for inclusion in ENCs which fulfill all relevant IHO quality standards. SevenCs and EOMAP have teamed together to provide an innovative service, the combination of up-to-date shallow water bathymetry provided as a standard ENC. This can therefore be used immediately on board vessels. 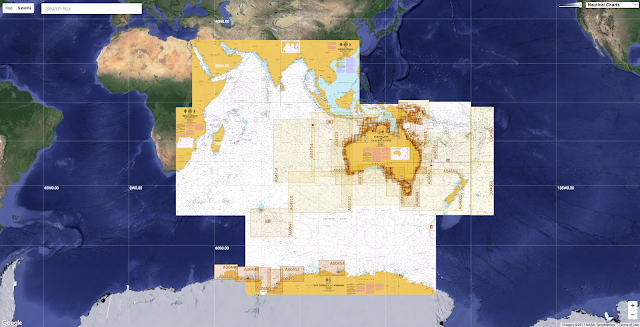 An update of official ENCs which include Satellite-derived Bathymetric data, is therefore possible at the commencement of a voyage, but also during the vessel’s journey - via satellite communication - and therefore allows for the planning of more efficient shipping routes, increased safety as well as an improved situational awareness to react to a forced change of the shipping route (e.g. weather events or other threats). It is obvious that the need for updating ENCs for safety of navigation is of importance for poorly mapped areas. It should not be understood to replace recent, high-resolution and quality ENCs if available. In 2016, bathymetric data was provided to Van Oord covering several atolls in The Maldives. The data were used to enhance safe navigation by charting all shoals which might or might not be indicated on Electronic Navigation Charts. This contributed to efficient planning of the project’s activities. Data were provided within a few days of ordering covering an area of several hundred sq. km, which showcases the flexibility of the technique. Figure 3: Baseline data on seafloor information based on satellite images and physics-based algorithms. Satellite-derived Bathymetry can play a role as a reconnaissance survey tool in applications ranging from shallow-water seismic surveys, coastal engineering to optimal planning of acoustic surveys. affordable within a typical planning phase budget. Reconnaissance surveys are usually relevant for areas which are poorly surveyed, where charts are outdated or where bathymetric data are simply not accessible. Many examples for these kinds of applications have already been published and two showcases are summarised in the following paragraphs. In 2013, EOMAP mapped the shallow-water bathymetry of the entire Great Barrier Reef, Australia, at 30m grid resolution. This was the first depth map of its kind for the entire Great Barrier Reef, and also the largest optical SDB dataset ever made. In 2014, Shell published a paper on the use of EOMAP’s Satellite-derived Bathymetry (delivered at 2m grid resolution) to support their shallow-water seismic campaign in northwest Qatar (Siermann et al. Shell summarised the benefits of using the satellite techniques over more traditional methods by citing a 1 Million USD costs savings and very timely delivery of the data. Figure 4: Example of the seamless multisource bathymetric grid for the Persian Gulf, including Satellite-derived bathymetric data (left) and the GEBCO dataset (right). Hydrodynamic modelling exercises, such as generating tsunami forecast models, are typically not the type of applications with budgets that allow for purchasing bathymetric survey campaigns using more traditional methods. Commonly, very coarse resolution bathymetric grids such as GEBCO are used instead, but this has limited validity in coastal areas. By using Satellite-derived Bathymetry, shallow-water depth data can be derived at fit-for-purpose grid resolution to within a limited budget. As a standalone dataset it does not fulfil the modellers requirements but when merged with up-to-date information on the coastline – (also derived from the satellite imagery), survey and chart information, a seamless shoreline-to-deep-water dataset can be created, which greatly improves on currently available datasets. Such a dataset was created for the Gulf region, which now serves as bathymetric dataset for tsunami modelling in the area. 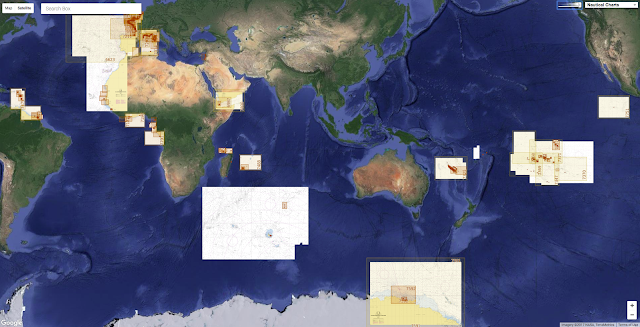 Over the intermediate term it is expected that satellite-derived mapping of the seafloor will continue to be increasingly accepted and integrated as a survey tool - as is now already the case for a number of innovative user groups. Developments are still needed in areas such as how to best quantify uncertainties and small scale obstructions. One likely development will be the mutlitemporal and sensor agnostic mapping approach, which can be oversimplified as: use all available image data to the best possible extent and quality. With the advances of cloud computing, physics-based algorithms and an increasing selection of image data, this is would be a natural evolution for Satellite-derived Bathymetry. The long-range under-ice sound communication system developed by WHOI engineer Lee Freitag and his colleagues. In the Arctic Ocean, a cold water layer bounded above and below by warmer layers acts as a "sound duct" that channels sound waves over long distances. 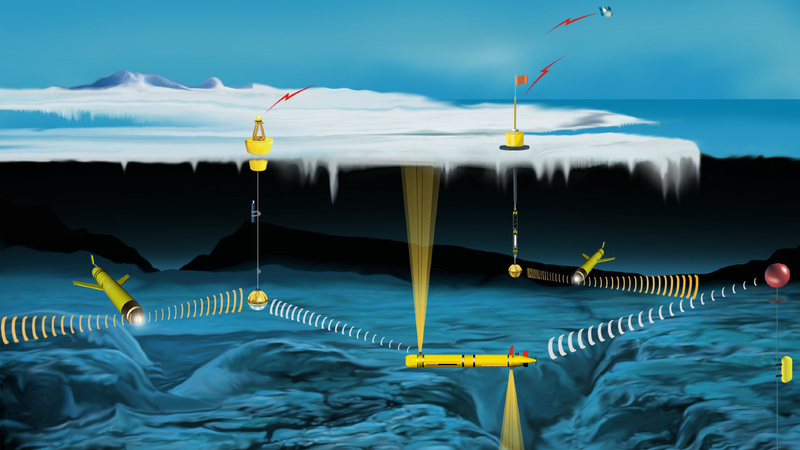 Sound beacons suspended in the channel emit information-carrying sound signals that travel to other buoys and to autonomous underwater vehicles under the ice. 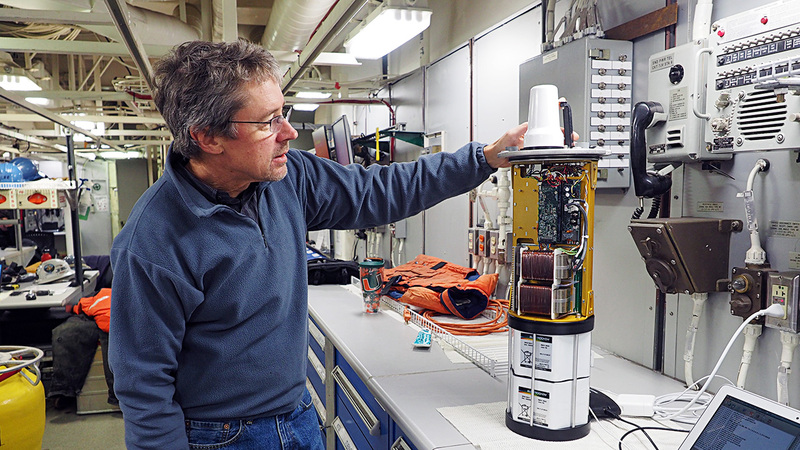 Data is relayed from the buoys to scientists via satellite. anks Island is one of 36,563 ice-covered islands sprinkled in the Arctic Ocean north of Canada. It is home to the world’s largest population of muskoxen—about 68,000—one tiny village with a population of slightly more than 100 people, and an airport, which during the spring and summer of 2014 bustled with researchers poised to jump into the vast white Arctic. Peter Koski and John Kemp, two engineers at Woods Hole Oceanographic Institution (WHOI), waited in the isolated village through days of high winds and frozen fog. Finally, on a Saturday in March, the weather cleared. A pilot gave the OK.
Then pilot, co-pilot, mechanic, Koski, and Kemp took off and flew out over the frozen Beaufort Sea in a small red Twin Otter plane packed full of cables and buoys. During two days of hectic, hopscotching flights, taking off and landing on patches of floating sea ice, they set up equipment at eight remote sites to carry out a long-awaited experiment. Their goal was to establish a long-distance communications system that would transmit and receive signals under water and under ice. Like the telegraph in the Old West, such a system could open up this previously inaccessible ocean to exploration, allowing fleets of autonomous underwater vehicles to navigate and collect data in ice-covered areas where ships and people cannot easily go. Such data are essential for scientists and the Navy to gain better understanding of the Arctic, a critical region for both environmental and military reasons, that is rapidly changing. The key to the experiment lay in taking advantage of a naturally occurring layer of water that forms in the Arctic and efficiently channels sound over long ranges—a sound duct within the ocean. Scientists and the Navy had exploited similar sound ducts in other oceans to measure the water temperatures and find distant submarines. Would it work in the Arctic Ocean, where the upper 3,280 feet (1,000 meters) of the ocean is completely different than anywhere else in the world? A possible future integrated acoustic communications system in the Arctic. Autonomous vehicles and gliders transmit data via sound signals to transponders suspended beneath the ice. The transponders send the data to the buoys antennas, and from there via satellite to scientists in other locations. Scientists can control vehicles movements by communicating via satellite to the buoys, which send sound signals to the vehicles. Many transmission options available on land, such as light and radio waves, don’t work under water. But as whales know well, sound travels far under water, especially low-frequency sound. Indeed, scientists with acoustic receivers can sometime hear the deep tones of whale songs or sound waves from earthquakes from thousands of miles away. During World War II, two scientists, Maurice Ewing and J.
Lamar Worzel, conducted basic research at WHOI on sound wave propagation in the ocean—seeking any advantages that would help the Navy detect enemy submarines or mines, or help American subs avoid detection. In a critical experiment, they detonated one pound of TNT under water near the Bahamas and detected the sound 2,000 miles away near West Africa. The test confirmed Ewing’s theory that low-frequency sound waves were less easily scattered or absorbed by water and could travel very far. 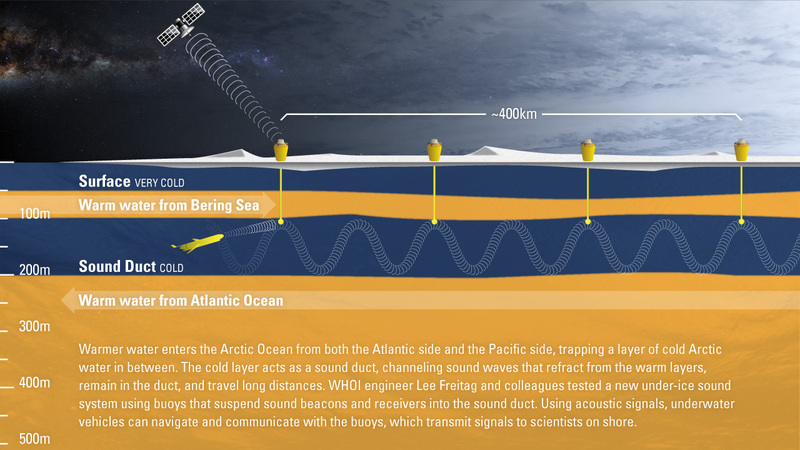 The scientists discovered a layer of water, between 2,000 and 4,000 feet deep in the ocean, that acted like a pipeline to channel low-frequency sound and transmit it over long distances: the SOFAR (Sound Fixing and Ranging) channel. The explanation for the SOFAR channel is that the ocean settles into either denser or more buoyant layers of water based on their salinity and temperature. Sound energy travels in waves that speed up in waters near the surface, where temperatures are warmer, or near the bottom, where water pressure is higher. In between lies the SOFAR channel, which is bounded top and bottom by water layers where sound velocities are high and sound dissipates quickly. The boundaries act like a ceiling and floor. When sound energy enters the channel from below, it slows down. When it interacts with the ceiling, it is refracted back downward. Eventually it reaches the bottom boundary of the channel, the high-pressure water near the seafloor, and is refracted back upward again. In this way, sound is efficiently channeled horizontally with minimal loss of signal. The Navy immediately saw the value of the SOFAR channel. It deployed a network of underwater microphones, called hydrophones, to optimally exploit the SOFAR channel to listen for submarines. More than six decades later, WHOI researchers explored whether something similar might work in the Arctic. A WHOI engineering team led by Lee Freitag and including Keenan Ball, James Partan, Peter Koski, and Sandipa Singh developed a system to achieve long-distance sound communication under the ice, enabling the control of navigation of autonomous vehicles. Koski and Kemp brought it to Banks Island to put it to the ultimate test. On the U.S. Coast Guard icebreaker Healy during a 2016 follow-on experiment in the Arctic, WHOI research engineer Lee Freitag examines the electronics to a new sound-based communications and navigation system that he and his colleagues developed and used in the Arctic. The reasons to study the Arctic are compelling. It is the region of the globe that is warming fastest, causing rapid changes in air-ice-ocean dynamics that not only change the Arctic’s climate but also have cascading impacts on global climate. Arctic sea ice is diminishing in summer, opening navigation routes and changing the naval theater of operations. Barriers to studying the Arctic are numerous: 24-hour darkness in winter, severe weather and safety concerns, high expense, and few ships capable of moving through ice. Autonomous underwater vehicles (AUVs) offer a way around these difficulties, since they could work under the ice without scientists or ships present. The biggest obstacle has been communications and navigation. Even in summer, ice makes it impossible for an AUV to come to the surface, take a GPS reading, transmit its data and position, and receive commands. “We wanted to learn whether we could use acoustic communication in the Arctic to support autonomous vehicles and sensors,” Freitag said. The system is designed to take advantage of a unique combination of conditions that creates a sound channel in the Arctic Ocean. At the top of the world, water enters the Arctic Ocean from both the Atlantic and Pacific. Both incoming water masses are warmer than the water residing in the central Arctic Ocean. “A deeper layer of warm water comes in on the Atlantic side through the Fram Strait,” Freitag said, “and circulates around the Arctic Ocean at about three hundred meters depth. These different incoming currents create a watery “layer cake” of different densities and temperatures in the Canada Basin, where Freitag’s team worked. “You have very cold Arctic air above the surface, causing very cold water at the surface,” Freitag said. “Then a warmer layer originally from the Pacific at fifty to a hundred meters. The two warm layers create top and bottom boundaries to a colder layer, which is the sound duct. While narrower in depth than the SOFAR channel of the temperate ocean, the sound channel in this area north of Alaska and Canada acts similarly. “Sound stays in this duct, bounded by these two warm layers,” Freitag said. “Warmer water above and below results in a faster sound speed. Sound bends away from the faster water and the sound in the duct travels farther. 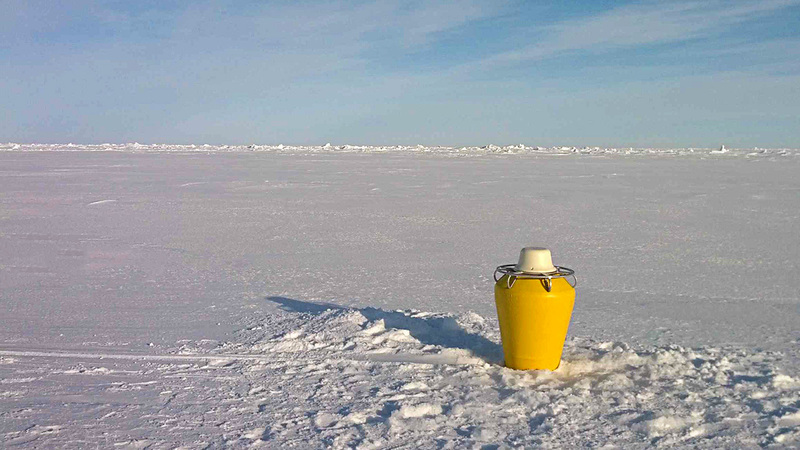 A lone buoy sits atop Arctic ice in the Canada Basin. In the water below the buoy, a sound beacon in the cold-water "sound duct"; sends out sound-wave signals to communicate with other buoys and autonomous underwater vehicles hundreds of miles away, part of a new long-range under-ice acoustic communication system. Back on Banks Island, Koski and Kemp waited to test the new acoustic communications system as poor weather canceled takeoffs and research teams stacked up waiting for flights. “It’s late into March, and we had to do it before the ice condition deteriorated,” Koski said. Sea ice begins to melt more as 24-hour sunlight returns in summer. “Every day you wake up, and the pilots decide if the day is good to fly,” he said. “The pilots have done it before, and they know what they’re looking at,” Koski said. Twin Otters carry a 2,000-pound payload, including people, equipment, and fuel, Koski said, so five people made up about half the load. Each flight to an ice location took two hops, with a stop to refuel on ice five to ten feet thick. “Sometimes, when a team intended to overnight on the ice, they took a bear dog in the plane,” Koski said. “They hired a trapper or hunter from town, and his dog, to go out with them. Koski and Kemp—WHOI’s Moorings Operations Group leader—used an auger to drill holes through the ice and install pairs of small buoys at intervals from 24 to 240 miles away from Banks Island. “We did the farthest point first, so we didn’t get stranded, and made hops on the way back where we could refuel,” Koski said. “The pilots like to help out. They’re interested, and everyone depends on each other. Each buoy connnected to a long cable fed through the drill-hole. Each cable carried a transducer suspended within the sound duct, 328 feet down. Every four hours, the transducers sent out sound signals at a frequency of 900 hertz, about the top of a soprano’s singing range. “The signal levels are kept as low as possible to conserve energy, and span less than one minute every four hours, minimizing potential environmental impact. In addition, the sources are never operated in sensitive areas near the Alaska coast,” Freitag said. “We’d land, get the auger set up, twenty minutes to drill the hole,” Koski said. 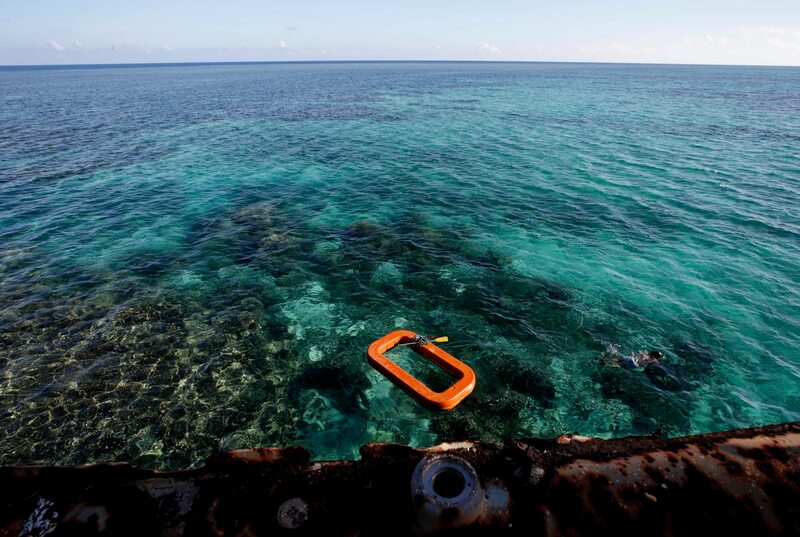 “Someone stretches out the equipment and cable, so the buoy is a hundred meters away from the hole. Make final electrical connections at that point, then put the transducer into the water and turn it on. “The ‘go, no-go’ point is if you can hear the sound signal with your ears,” he said. “If it’s working, you can hear it. Freitag was watching on his laptop from the United States, and WHOI scientist Steve Jayne was on Banks Island, when the first signals from the ice buoys deployed by Kemp and Koski reached them. Signals transmitted via satellite from all eight buoys came through. “In the course of a weekend, they had put eight buoys in, and the buoys were all able to talk to each other,” Freitag said. That July, researchers from the University of Washington launched gliders from a boat out of Prudhoe Bay, Alaska, to test whether the gliders would communicate with the buoy system. The gliders traveled up and down through the ocean gathering temperature data. They detected and responded to signals from the WHOI buoy system—but only when they were within the boundaries of the 328- to 984-foot (100- to 300-meter) sound duct. “We learned that you have to be able to synchronize the time when the transducer’s beacons transmit to the time when the gliders are up in that layer of water—otherwise, they don’t hear it,” Freitag said. Ironically, the Arctic sound duct that researchers may now use to gain understanding of the region’s rapid climate change is being strengthened by that very same climate change. “Data show that over the last thirty years this warmer layer has gotten warmer,” Freitag said. “What happens in the future, that’s not clear,” he said. “The change in Arctic temperature is absolutely what has enabled this Arctic acoustic network to actually work the way that it does,” Freitag said. “But in the middle of the winter, there’s still going to be ice. Robotic vehicles could be gathering data under that winter ice, navigating via an under-ice communications system that transmits the data back to scientists warm and snug in their labs. A Philippine marine swims in the waters of Second Thomas Shoal in the South China Sea. One-third of global maritime traffic. An estimated $5 trillion in annual trade. Six claimant nations. One body of water. And that’s just on the surface. Welcome to the South China Sea, the geographic commons of Southeast Asia’s navigable rimland. Its 3.5 million square kilometers of underlying bedrock contain oil and natural gas deposits that, by official U.S. estimates, are at least equal to Mexico’s and, by some contested Chinese estimates, might be second only to Saudi Arabia’s. Also home to lucrative fisheries and supply routes that carry 80 percent of China’s crude imports, the territorially disputed region may be the most strategically important waterway of the 21st century. Tracing shorelines of sprawling, hard-to-govern archipelago nation-states to the south, the sea is bound to the north by China, whose contentious claims to more than 95 percent of the region—first espoused by the nationalist government in 1947—cite ancient maritime records. 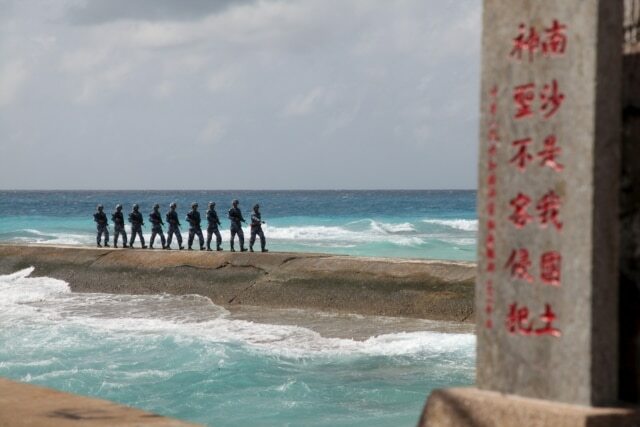 Beyond a sign that says “Nansha is our national land, sacred and inviolable,” Chinese troops patrol artificial terrain in the Spratly Islands, which are known as a Nansha in Mandarin, February 9, 2016. For centuries, these waters also have been vital to the economic survival of neighboring Vietnam, Malaysia, Brunei and the Philippines. The waters are also prized by regional non-claimants. For U.S.-allied Japan and South Korea, situated far to the north, South China Sea shipping lanes provide access to trade-intensive waters of the Indian Ocean, via which more than half of their respective energy needs are met. For non-claimant Indonesia, Natuna Sea fishing grounds along the southern fringe of the contested region hold vital natural gas reserves. Many nations have urged Beijing to abide by the United Nations Convention on the Law of the Sea (UNCLOS), which sets maritime zones of control based on coastlines. The United States, which has signed onto UNCLOS without ratifying it, often relies on the international agreement to settle territorial disputes. China has refrained, invoking intertemporal laws based on the deep historical record, such as archaeological findings on disputed reefs and islands. At best, China views U.N.-backed codes of maritime governance as incompatible with domestic laws; at worst, it sees them as instruments of Western hegemony designed to undercut its expanding influence as a world power. The U. S. has said establishing a “rule-based order” for the South China Sea, which carries a large portion of the world's maritime freight traffic, is critical to regional security and economic prosperity, both cornerstones of U.S. policy on the Asia-Pacific. 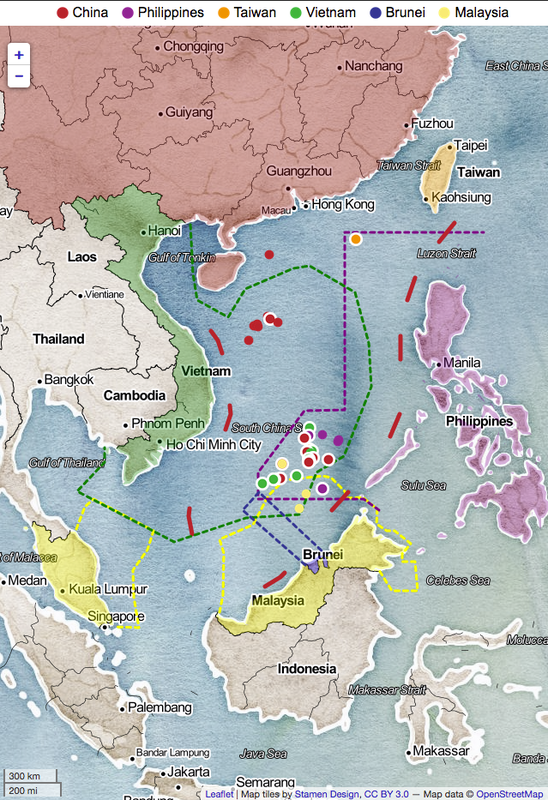 China’s territorial claims in the South China Sea have raised tensions with surrounding countries. If Asia’s astonishing economic growth of the past two decades continues, however, regional stability will remain a matter of global consequence. Beyond China’s increasingly assertive land grabs and island-building campaigns—some 1,300 hectares of tiny islets have been landfilled to sustain mostly military infrastructure, including runways long enough to accommodate bombers—low-level skirmishes between Chinese naval patrols and civilian fishing fleets from neighboring countries could spark international conflict. In July, a five-judge panel in The Hague unanimously rejected the legal basis of nearly all of China’s maritime claims. Within weeks, China’s Supreme People’s Court issued a regulation stating a “clear legal basis for China to safeguard maritime order,” in which Beijing vowed to prosecute any foreigners found fishing or prospecting in disputed waters. Other means of settling complex territorial disputes also appear ineffective. The Association of Southeast Asian Nations’ long-delayed code of conduct for the South China Sea, which Beijing officials said they would finalize in 2017, would do little to resolve conflicting claims of sovereignty. Much like the Hague-based tribunal’s ruling, any legally binding ASEAN declaration would lack meaningful mechanisms of enforcement. While the United States has long said it does not take an official position on South China Sea disputes, it steadily criticizes China’s behavior there and plans to expand defense alliances with countries that have overlapping claims. By 2021, U.S. Navy officials plan to expand the Pacific Fleet’s overseas assigned forces by approximately 30 percent. China's Liaoning aircraft carrier pictured taking part in exercises in the South China Sea last month. As President-elect Donald Trump takes office, he may be called upon quickly to handle another South China Sea crisis. Just months into his first term, former President George W. Bush faced an international dispute triggered by a midair collision between a U.S. spy plane and a Chinese fighter jet near Hainan Island. Less than seven weeks after President Barack Obama took office, Chinese ships and planes confronted the USNS Impeccable, a surveillance ship in waters south of Hainan, and ordered it to leave. The U.S. said that it had the right to be there and that the ship was harassed, while Beijing defended its actions. Obama responded by sending a guided-missile destroyer to protect the Impeccable. Such incidents, engineered or otherwise, are likely to continue defining the dispute as it unfolds in real time. Until broader questions of maritime sovereignty are resolved, the waterway promises to remain a fulcrum upon which the geopolitics of international trade, and thus the global economy, pivots. We’ll keep close tabs on developments here as they occur. 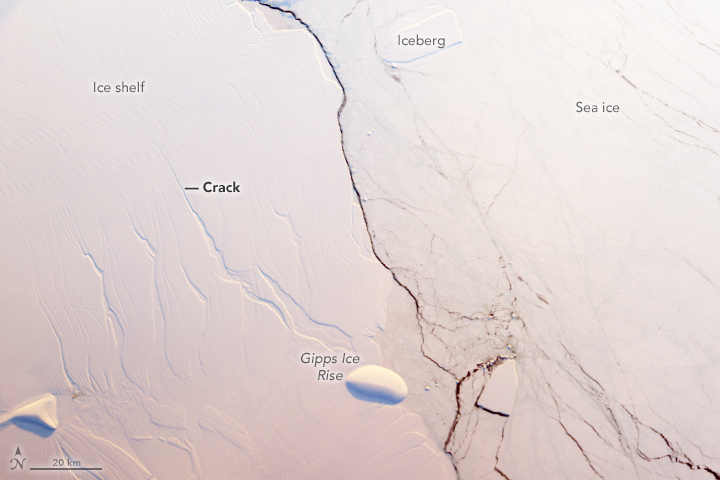 The crack in this Antarctic ice shelf just grew by 11 miles. A dramatic break could be imminent. The current location of the rift on Larsen C, as of January 2017. Labels highlight significant jumps. Tip positions are derived from Landsat (USGS) and Sentinel-1 InSAR (ESA) data. 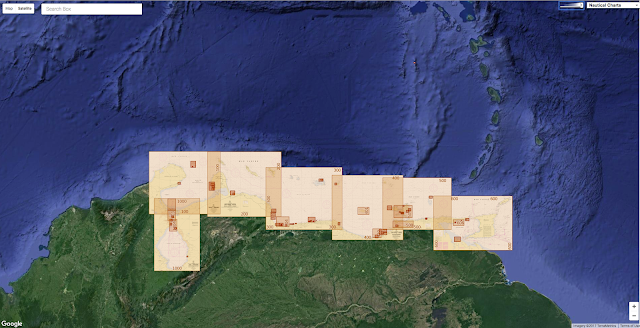 Background image blends BEDMAP2 Elevation (BAS) with MODIS MOA2009 Image mosaic (NSIDC). Other data from SCAR ADD and OSM. An enormous rift in one of Antarctica’s largest ice shelves grew dramatically over the past month, and a chunk nearly the size of Delaware could break away as soon as later this winter, British scientists reported this week. If this happens, it could accelerate a further breakup of the ice shelf, essentially removing a massive cork of ice that keeps some of Antarctica’s glaciers from flowing into the ocean. The long term result, scientists project, could be to noticeably raise global sea levels by 10 centimeters, or almost four inches. It’s the latest sign of major ice loss in the fast warming Antarctic Peninsula, which has already seen the breakup of two other shelves in the same region, events that have been widely attributed to climate change. The crack in the ice shelf, known as Larsen C, has been growing at an accelerating rate. Since the beginning of December, it has grown about 11 miles in length, after extending 13 miles earlier in the year. In total, the rift has grown about 50 miles since 2011 (it’s almost 100 miles long in total), and has widened to well over 1,000 feet. Now, only 12 miles of ice continue to connect the chunk with the rest of the ice shelf. When it breaks away, the loss would be of nearly 2,000 square miles of ice, say the researchers with Project MIDAS, a British government-funded collaboration based at Swansea and Aberystwyth universities in Wales. That’s larger than Rhode Island and almost as big as Delaware. The consequences of the break could be dramatic. “When it calves, the Larsen C Ice Shelf will lose more than 10% of its area to leave the ice front at its most retreated position ever recorded; this event will fundamentally change the landscape of the Antarctic Peninsula,” said the researchers in a statement about the rift. The British Antarctic Survey also released a statement on the growing rift, saying a huge iceberg is “set to calve” from Larsen C.
“Because of the uncertainty surrounding the stability of the Larsen C ice shelf, we chose not to camp on the ice this season,” David Vaughan, the survey’s director of science, said in the statement. The floating ice shelf is fed by the flow of ice glaciers that sit above sea level on the Antarctic Peninsula. As the shelf loses mass, these glaciers could flow more quickly — which would contribute to rising sea levels. Losses from the ice shelf alone, however dramatic, would not have that effect, as the shelf is already floating on water, just like an ice cube in a glass of water. Fortunately, the Antarctic Peninsula does not contain nearly as much ice as other, thicker parts of Antarctica, such as the West and East Antarctic ice sheets. The potential sea level rise if Larsen C is lost would be measured in centimeters, not feet. Still, it would subtract a major, enduring feature from the planet, and add to already dramatic changes that have been seen in the Antarctic Peninsula, the portion of the icy continent that extends northward towards South America. Two smaller ice shelves near Larsen C – Larsen A, and Larsen B – have already largely disintegrated. Larsen B retains a remnant of its former size, but scientists have determined that this ice, too, could vanish before too long. They have also documented that following the collapse of much of the Larsen B ice shelf in 2002, the glaciers behind it sped up their flow towards the sea. Now, the fear is the same process could be unleashed on the larger Larsen C shelf. The Larsen C ice shelf is more than 1,000 feet thick, and in spatial extent, nearly the size of Scotland. It is the fourth-largest ice shelf in Antarctica, although nothing compared with the two largest, the Ross and Filchner-Ronne ice shelves. An iceberg expected to be one of the 10 largest ever recorded is ready to break away from Antarctica, scientists say. A long-running rift in the Larsen C ice shelf grew suddenly in December and now just 20km of ice is keeping the 5,000 sq km piece from floating away. 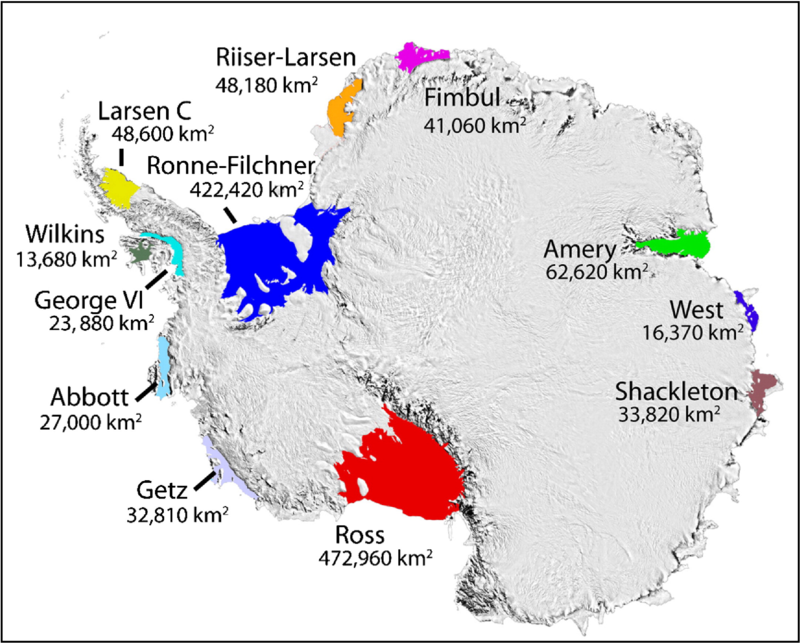 Larsen C is the most northern major ice shelf in Antarctica. Researchers based in Swansea say the loss of a piece a quarter of the size of Wales will leave the whole shelf vulnerable to future break-up. NASA, during a flight in November, captured several spectacular photos of the rift, including the one at the top of this article and also the close-up below. But that was before further extension of the rift last month. The Antarctic continent is ringed with ice shelves, which are the ocean-front portions of larger glaciers. But as the climate changes, these features have been thinning and in some cases breaking apart dramatically. The Project MIDAS group did not immediately make a statement attributing the development at Larsen C to climate change, but the fact that the shelf would be “at its most retreated position ever recorded” after the break is certainly suggestive. Previous research has also documented that the Larsen C ice shelf is becoming less thick, and so floating lower in the water, and this appears tied to the warming of the Antarctic Peninsula in recent decades. Warmer seas could also be playing a role. Now, the wait for the anticipated break begins. Daniela Jansen, a researcher with the Alfred Wegener Institute in Germany who collaborates with the Project MIDAS team, largely agreed in an email to The Washington Post. “I think the iceberg will calve soon,” she said. Take the Spice Islands of Tanzania and a dug out canoe with a hanky, mix them together with a healthy dose of chaos and the world's greatest sailing race is born.